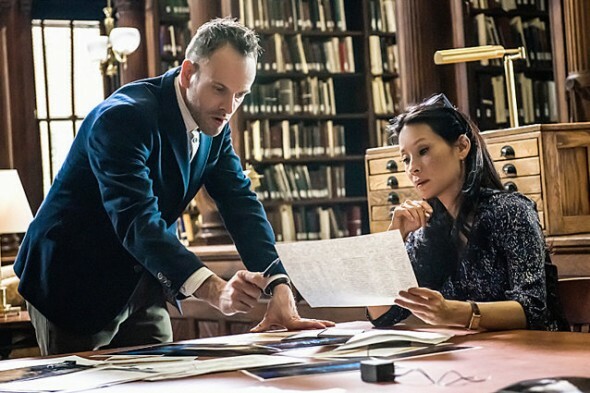 Will Elementary return for season six? The CBS series is nearing the end of its fifth season and has not been renewed. What do you think? Should the TV show be cancelled or renewed for another season? The drama follows eccentric detective Sherlock Holmes (Jonny Lee Miller) and Doctor Joan Watson (Lucy Liu) as they help solve crimes in modern-day New York. The cast also includes Aidan Quinn and Jon Michael Hill. Given ratings alone, a renewal for Elementary looks uncertain. Currently, season five is averaging a 0.67 rating in the 18-49 demo and only 4.975 million viewers — low numbers for CBS. However, despite the poor ratings, Deadline reports a season six renewal seems likely. Are you a fan of Elementary? Do you think the show has run its course? Would you watch a sixth season? Please take the poll and tell us what you think. Love the show. looking forward to season six. lets go CBS. tired of my favorite shows being cancelled. Please add several more seasons of “Elementary” — I would watch it for many years ahead! Love it!! I was happy, and surprised, that ELEMENTARY quickly became one of my favorite shows! It takes a well-used theme and reformats it into an American city, in todays time frame, with updated characters. The stories are excellent, with familiar twists and turns, brought up to date and given an extra jolt to keep you guessing right up to the resolution! All of the characters are multi-faceted, their parts well-written, and marvelously well-acted. I do miss the Mrs. Hudson character. And I even like the re-runs! I’ll be watching as long as they keep this show on TV! I plan my schedule around watching Elementary and I also DVR it if necessary. I would definitely watch another season and more as long as the episode plots continue to be interesting. The writers for “Person of Interest” wrote that series right into a corner and off the air. I hope that doesn’t happen here. This show is unique, exciting and the chemistry between Sherlock and Watson are both thought provoking and humorous [at times] and should continue onto a 6th season and beyond but I agree with so many others, it is difficult to follow on the night it now airs. Please move to another time slot and continue the great story lines it has produced since Season 1! Love the show. Always look forward to it. Its a keeper. Elementary is a GREAT show with two great actors. There is so much **** on TV that I just love watching it. Please keep it on! We have it in our top 5 shows and would greatly miss it. put it on a different night. stupid football messes with any show on after it because you never know when the dumb game is over. put 60 minutes on after game. there is a thought. love the show Elementary. don’t screw this up! Bring it back! Friday would be a great night. But more importantly make sure it doesn’t air after sports example like NFL football. If game a goes into overtime you miss part of series. When your not home and have shows recording it stinks to miss out on a favorite shows! his program is terrific! Great interactions and excellent acting. keep it going. Season 7 would be great! I love this show. I watch from CBS All Access because I am not consistently home when it airs. LOVE THE SHOW, ACTORS, STORY LINES, & PRODUCTION.